Panoramic view of Lake Winnipesaukee looking north from the summit of Mount Major. The entrance to Alton Bay lies at the right edge of the picture. The large island near the center-left is Rattlesnake Island, while the three islands in front of it (l-r) are Sleeper’s Island, Cub Island, and Treasure Island. The island to the left of Rattlesnake Island is Diamond Island. Wolfeboro Bay is visible at the far side of the lake near the center-right of the image. Lake Winnipesaukee is the largest lake in the U.S. state of New Hampshire located in the Lakes Region. It is approximately 21 miles long and 9 miles wide, covering 69 square miles — 71 square miles when Paugus Bay is included — with a maximum depth of 180 feet. The lake contains at least 258 islands, half of which are less than a quarter-acre in size, and is indented by several peninsulas, yielding a total shoreline of approximately 288 miles. The driving distance around the lake is 63 miles. The lake is 504 feet above sea level. Winnipesaukee is the third-largest lake in New England after Lake Champlain and Moosehead Lake. There is a place for everyone on Lake Winnipesaukee to chart their own course for adventure and year-round fun. A quick 2-hour drive from Boston, Lake Winnipesaukee is truly a perfect getaway. As a popular summer destination, seasonal and permanent residents get to soak up the sun while sailing, kayaking, water-skiing, fishing, or simply lounging by the lake. Discover Lake Winnipesaukee from a high altitude while hiking West Rattlesnake Hill, Ossipee Mountain, or Belknap Range’s many trails. Lake Winnipesaukee’s many surrounding towns provide fine dining, local shops, and seasonal events. Even when the temperature drops, Lake Winnipesaukee provides the visitor with a variety of activities and winter sports. From hitting the slopes at Gunsmoke Mountain Resort to snowmobiling along the lakeshore, Lake Winnipesaukee is a four-season getaway. There are eight cities and towns that border Lake Winnipesaukee in New Hampshire – Alton, Center Harbor, Gilford, Laconia, Meredith, Moultonborough, Tuftonboro and Wolfeboro. By far the largest lake in the state, Lake Winnipesaukee covers an incredible 44,586 New Hampshire acres. The lake is the third largest lake in all of New England, trailing Lake Champlain and Moosehead Lake. Lake Winnipesaukee lures tourists and residents to its shores year-round. Five dams control the lake’s water levels as it flows downhill to meet the Merrimack River on its way to the Atlantic Ocean. The lake is huge, and just driving around it is a 63-mile undertaking. As if to prove its size, over 260 islands dot Lake Winnipesaukee’s surface. Because of the sheer size of the lake and circuitous nature of driving its circumference, it is best to see the lake by boat. You can either take your own or rent one when you get here, but you are in for a treat when you head out into the Winnipesaukee waters. Surprisingly to some, boating on Lake Winnipesaukee is truly a year-round activity. Summer brings power boaters who speed over wake, hair blowing in the breeze, pontoon boats out for an afternoon pleasure cruise, and canoeists and kayakers interested in testing their endurance as they explore each nook and cranny of a cove. Ice sailing prevails in winter, and you will find sailboats lined up for competitions or friendly contests in this interesting sport. The lake consists of a wide, relatively open central region known as the Broads, surrounded by several large bays, as well as many smaller inlets. “The Witches” is a rocky area between Timber and Governor’s Islands. They are a group of extremely dangerous rocks that lies both below and just at the surface of the lake. They earned their name because they protrude from the lake like “Witches Hats”. Endicott Rock (housed in a small stone building near the channel at Weirs Beach) is named for John Endicott, Governor of Massachusetts Bay Colony and was at one time the northern most boundary of Massachusetts Bay Colony. The boundary was established in the summer of 1652. The Indian atop the monument is known as “Captain Jack”. The Winnipesaukee River flows out of Lake Winnipesaukee at the channel at Weirs beach, through Paugus Back, over a dam in the Lakeport area of Laconia, into Lake Opechee, and on to Lake Winnisquam. The Broads a wide portion of Lake Winnipesaukee largely in Belknap County and extending slightly into Carroll County. It is a large island-free zone occupying the center of the lake. Running along the main axis of the lake, the northwestern tip of the Broads is at the town of Center Harbor, while the southeastern end lies between the towns of Alton and Wolfeboro. The open nature of the Broads can lead to rougher water than the rest of the lake. Swells of 1-3 feet are not uncommon when winds top 10 miles per hour. Meredith Bay lies at the western edge of Winnipesaukee. At the northern tip of Meredith Bay is the main village of the town of Meredith. Meredith Bay is separated from the Broads by a relatively narrow strait bordered by Governors Island to the south and Stonedam Island to the north. The northeastern shore of Meredith Bay is a long peninsula known as Meredith Neck. Meredith Bay hosts the New England Pond Hockey Tournament and Ice Fishing Derby on the ice each winter. Paugus Bay branches off to the south of Meredith Bay at Weirs Beach, near to where Meredith Bay joins the main body of the lake. Formerly a hydrologically distinct lake, Paugus Bay became joined to Winnipesaukee when the dam at Lakeport was constructed, raising the surface of Paugus Bay to be contiguous with Winnipesaukee. Paugus Bay joins the main lake in Meredith Bay, running south from a narrow channel connecting it to Meredith Bay. At the northern end of Paugus Bay, where it joins the main lake, is Weirs Beach, the largest and most visited public beach on the lake. At the other end is the village of Lakeport. Both Weirs Beach and Lakeport are villages within the city of Laconia. The eastern shore of the bay is closely followed by U.S. Route 3, and has numerous motels, hotels, inns, and bungalow complexes. The western shore is much less developed. Alton Bay is a narrow bay which runs due south from the southern corner of the main lake. It lies entirely within the town of Alton. The village of Alton Bay lies at the extreme southern tip. The Alton Bay Seaplane Base is a state-owned, public-use seaplane base in Alton Bay, the southeast arm of the lake. In the winter it is the only FAA-approved ice runway in the contiguous United States, conditions permitting. Wolfeboro Bay is a relatively small wide bay lying in the town of Wolfeboro, creating a small northerly bulge in the shoreline to the eastern edge of Winnipesaukee. A series of smaller lakes and streams connects Wolfeboro Bay to Lake Wentworth. Winter Harbor is a Y-shaped bay with two branches, separated from the Broads by Wolfeboro Neck and Tuftonboro Neck. Winter Harbor is surrounded by many quiet resort communities in the towns of Wolfeboro and Tuftonboro. It also has panoramic views of the Belknap Mountains and looks out toward Rattlesnake Island. Moultonborough Bay is the longest bay on Winnipesaukee. It is connected to the Broads by some narrow straits running between a cluster of islands including Long Island (the largest island in the lake), Cow Island, Little Bear Island, Sandy Island, and dozens of smaller islands and islets. The 7-mile-long Moultonborough Neck separates the length of the bay from the main axis of the lake, and the Suissevale development in the town of Moultonborough is at the northern tip of the bay. Melvin Village, the main lakeside village of the town of Tuftonboro lies along the northeastern shore of the bay, closer to where it joins the Broads. Long ago a great chief, Wonaton, and his fair daughter, Mineola, lived on the northern shores of Lake Winnipesaukee. Mineola had many suitors but refused them all. One day, a young chief, Adiwando, from an enemy tribe in the south paddled across the lake and entered the village. Natives from Wonaton’s tribe saw his bravery and did not stop him. Mineola and Adiwando fell in love and wanted to marry. Wonaton was angry and tried to kill Adiwando. Mineola rushed between them and begged her father to stop. After they were wed, the whole tribe went in canoes to the middle of the lake. The skies were dark and as they began to leave, the sun came out around the canoe of Minola and Adiwando. “The Lady of the Lake” built in Lakeport in 1849 was the first boat built over 100 feet in length that provided public transportation on Lake Winnipesaukee in New Hampshire. The original “Mount” was the “Lady of the Lake.” When the Boston and Maine decided to cease “the old steamship business” during the 1920’s, the Mount Washington was sold. It was turned into a passenger vessel for summer tourists. 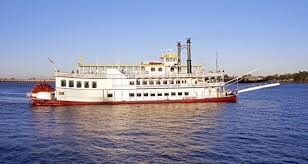 The M/S Mount Washington was destroyed by fire in 1939 along with the Weirs Cafe, Railroad Station and a seaplane. After the fire a new vessel was found and assembled from the hull of a Lake Champlain vessel called the Chateugay. The M/S Mount Washington stops at Wolfeboro, Alton Bay, Weirs Beach, Meredith and Center. Harbor. The Mount runs from ice out until mid-October. The Mount is wintered in Center Harbor. The Sophie C. is a mailboat on Lake Winnipesaukee. It delivers mail to the people who live on the islands. It was named after the owner’s mother. The Sophie C. is the oldest floating post office in the US and is the only mailboat on an inland waterway. The Doris E. provides scenic boat tours of smaller islands near Weirs Beach.